If you believe in the preservation of America's iconic wild mustangs and our wild places for generations to come, we invite you to walk with Wild Love Preserve. Your support translates to lasting wildness for wild horses on their home turf and respective indigenous ecosystems as a balanced whole. This is a WE project, and together we succeed on behalf of our greater good and collective well-being. Thank you for supporting Wild Love Preserve with your tax-deductible donations and for joining with us in protecting and nurturing the legacy of our wild places. Donations can always be made in the name of another as a gift or In Memoriam. Please feel free to contact us and we will be happy to personalize your giving heart. 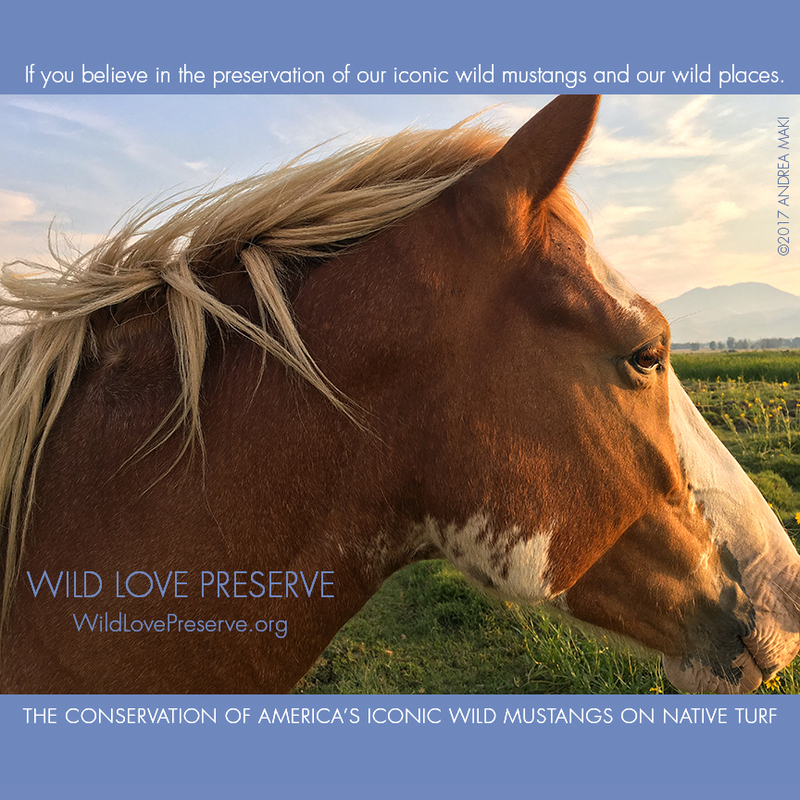 Wild Love Preserve is a humanity project created to protect and preserve western wild horses in their native habitats and nurture the legacy of respective indigenous ecosystems as an interconnected whole by bringing stakeholders together. Viewed by stakeholders from all sides as a paradigm shift, we have pioneered an all-inclusive model in wild horse conservation that has garnered national attention and is being sourced as a framework for other wild horse regions in the west. We work tenaciously to safeguard wild lives on their home turf and have subsequently saved hundreds of Idaho wild horses, on and off the range, and our programs have saved taxpayers over $7.5 million dollars since 2013. Because of Wild Love Preserve's continued due-diligence, collaborative, and pro-active efforts since 2010 with the Challis-Idaho Bureau of Land Management, there has not been a helicopter roundup of the Challis Herd since October 2012. Prior to Wild Love Preserve, the Challis BLM's intent was to conduct federally funded helicopter roundups and removals every other year. As of February 2018, Wild Love Preserve and the Challis-Idaho BLM will work together on the current Environmental Assessment of the Challis Herd Management Area as a collective whole, and together develop a 10-year pro-active management plan for the Challis Herd in conjunction with, and relation to, this indigenous ecosystem on our multi-use public lands as an interconnected whole. This collaborative work sets yet another new precedent which serves to benefit our work on all six herd management areas in Idaho, as well as other wild horse regions in the west. Watch our narrated video story above. LOVE IS ACTION. THANK YOU! Peace, love, understanding and co-existence, happening here at Wild Love Preserve. This is not impossible, this is a chosen way of being. Believe with your heart and act accordingly. It takes a village to implement far-reaching and lasting positive change. GreatNonprofits Top-Rated Nonprofit in 2017, 2016, 2014 + 2013. Read Our Reviews Here. Wild Love Preserve is a 501(c)3 Non-Profit, Effective August 2010, Tax ID #27-3729450.